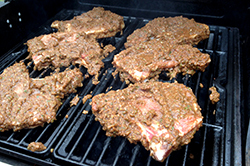 Jerk is the classic Jamaican spice for grilling and it’s a big bold smoking-hot taste. I’ve used three chiles for this to create a medium heat level by jerk standards. Add or subtract o taste, but remember: If its not hot, it’s not jerk. Always wear food-service gloves when handling chiles because they can hurt if you get some under your nail or touch your eye. 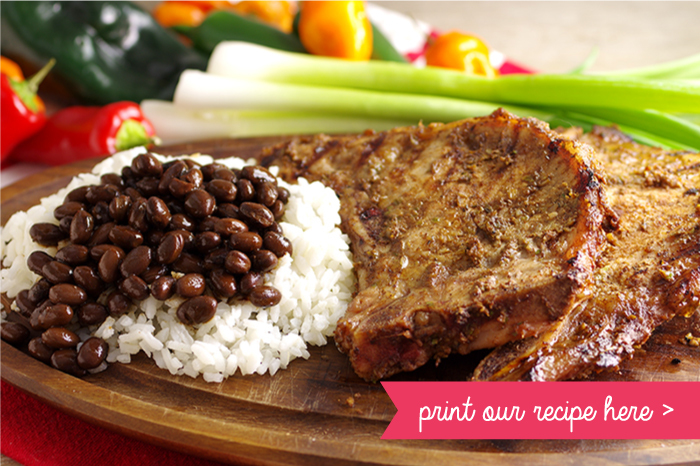 The classic sides to serve with this are rice and beans. 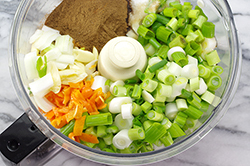 TO MAKE THE JERK PASTE: Place the onion, scallions, garlic, and chiles in the bowl of a large food processor fitted with the metal blade. Top with the allspice, salt, paprika, cinnamon, nutmeg, and thyme. 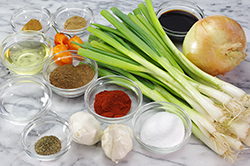 Pour in the soy sauce, vegetable oil, vinegar, and 1/4 cup/60 ml water. Pulse to break everything down and then process for about 30 seconds, until all the big chunks are gone. Put the jerk paste in a big nonreactive bowl. 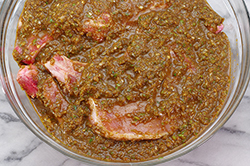 One at a time, dredge the pork chops in the paste, leaving them in the bowl when fully covered Cover the bowl and refrigerate for a t least 1 hour and up to 8 hours. Prepare an outdoor grill to cook direct over medium heat. Using cooking gloves to handle the pork, pull each chop out of the paste and place it directly on the grill grate, keeping as much paste on the chop as possible. 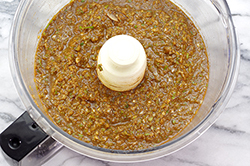 Discard the remaining paste. Cook for 4 to 5 minutes per side, until the chops are golden brown and have reached an internal temperature of 150°F/65°C. Transfer them to a platter and tent loosely with aluminum foil. Let them rest for 5 minutes before serving. Reprinted with permission from Pork Chop, 60 Recipes for Living High on the Hog by Ray “Dr. BBQ” Lampe. Copyright 2013. Published by Chronicle Books, San Francisco, CA. All rights reserved.